Commercial Edition - includes an all-new Violet ink (in place of Light Light Black) to deliver an industry-best 99 percent PANTONE® PLUS FORMULA GUIDE solid-coated color matching, ideal for commercial and flexographic proofing applications. Designer Edition - offers all the features of the Standard Edition, plus it includes EFI® Fiery® eXpress for Epson, an industry-leading software RIP with true Adobe® PostScript® 3™ for accurate CMYK and spot color printing. 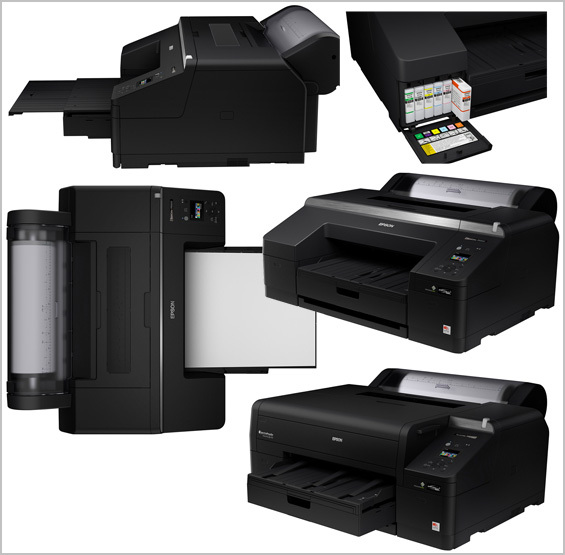 Easy to use - 2.7" LCD panel allows for easy setup, control and maintenance of the printer. or a Sales Reference Guide for this product. Ink Shelf Life: 2 years from printed production date or 6 months after opened Printer is designed for use with Epson cartridges only, not third-party cartridges or ink. 1. Ink lightfastness rating based on accelerated testing of prints on specialty media, displayed indoors, under glass. Actual print stability will vary according to media, printed image, display conditions, light intensity, humidity and atmospheric conditions. Epson does not guarantee longevity of prints. For maximum print life, display all prints under glass or lamination or properly store them. Visit www.wilhelm-research.com for the latest information. 2. 99% coverage of PANTONE PLUS FORMULA GUIDE solid-coated palette based on Epson Proofing Paper White Semimatte printed with the Epson Driver at 2880 x 1440 dpi. PANTONE coverage may vary when printed under other conditions. 3. Print times are based upon print engine speeds only. Total throughput depends upon front-end driver/RIP, file size, printing resolution, ink coverage, network speed, etc. Normal is for prints imaged using 1440 x 720 high-speed mode. 4. Ink used in conversion varies considerably based on temperature and other factors. 5. Allowed by printer driver for Mac® and PC. Application, version of application and operating system version may limit maximum length. Purchase an Epson SureColor P5000 Standard Edition printer by April 30, 2019, and you will be eligible to receive a $400.00 rebate from Epson. Purchase an Epson SureColor P5000 Commercial Edition printer by April 30, 2019, and you will be eligible to receive a $400.00 rebate from Epson. Purchase an Epson SureColor P5000 Designer Edition printer by April 30, 2019, and you will be eligible to receive a $450.00 rebate from Epson. For complete details, please download the Epson rebate form for these promotions.